Gardening is one of the simplest and most profound ways you can connect with nature. Thankfully, you have pollinators as allies to support you in your efforts. 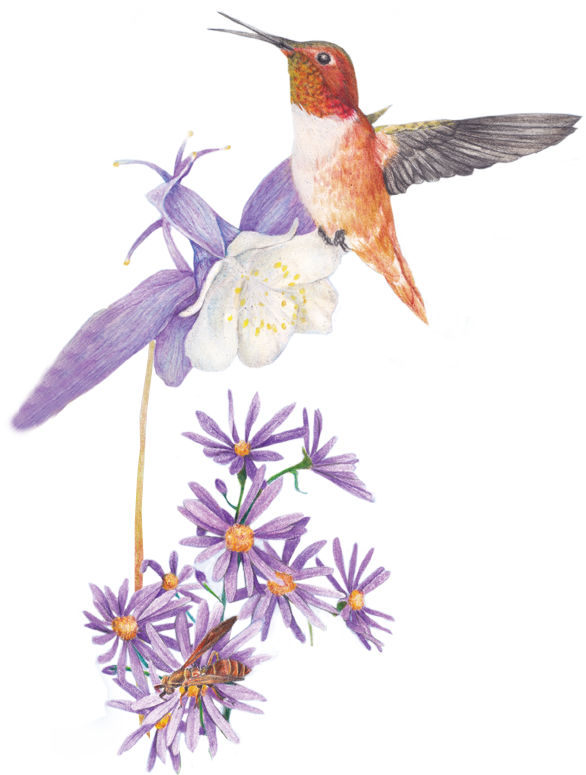 There are over 1,000 species of pollinating animals in Canada – from various bee, butterfly, moth and hummingbird species – that are responsible for billions of dollars’ worth of Canadian farm produce, flowers and ecosystems reliant on pollination. Planting with the CWF Pollinator Collection of Medallion Plants is a great way to attract pollinators to your garden. Pollination is one of the most important processes on the planet, which is why anything that adversely affects our precious pollinators – from habitat loss and pesticide use to disease and climate change – needs to be taken seriously. Plant with a purpose using CWF Pollinator Collection of Medallion Plants. It’s not just about conservation, it’s about rediscovering your own roots as a species reliant on pollinators to feed us all! Pollinators are animals that transfer pollen from one flower to another, mainly while drinking nectar and gathering pollen. The pollination services of these animals are critical for flowering plants to develop fruit with viable seeds that we (and wildlife) can eat. Some of these beneficial animals are Canadian favourites; others are less known or feared, keeping us from fully appreciating their services and unique beauty. But all are extremely important. From blueberries to cocoa beans, pollinators worldwide are responsible for some of the yummiest foods. It is estimated that their services contribute over a billion dollars annually to the Canadian economy. In fact, without pollinators, our food supply would suffer drastically. Equally important, pollinators help keep ecosystems healthy by maintaining a diversity of plants (including genetic diversity) and keeping various insect populations in check – hummingbirds eat flies and gnats, predacious insect larvae prey on other insects and parasitoid insects lay eggs that invade the bodies of other insects. Many of our pollinators are in decline. Challenges include habitat loss and degradation, pesticide use, various agricultural practices, infection, disease, climate change and introduced species. Share the wonders of these remarkable creatures with friends and neighbours. Grow plants in groups of three to five to help attract pollinators. Provide a shallow water dish with perching stones in your yard. Leave an undisturbed area of plants and fallen leaves in your garden and open areas of soil for nesting, mudpuddling, sheltering and overwintering. Maintain your outdoor spaces in an earth-friendly way, especially by avoiding pesticides. By mimicking nature, we naturally strengthen plants and discourage weeds and insects, which drastically reduces any need for alternate intervention. Nourish the soil with compost, use mulch where suitable to protect plant roots, keep soil in place, return nutrients to the earth and suppress weeds. Learn which butterflies are in your area and plant larval host plants to encourage their populations. 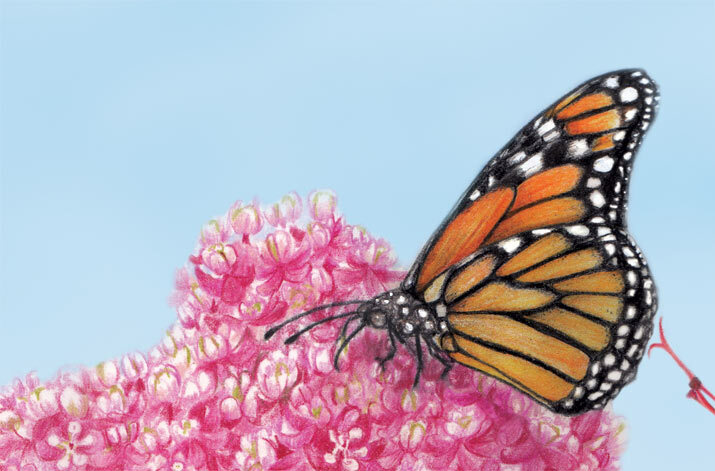 The monarch butterfly is in great need of milkweed for its caterpillars. There are 14 native milkweed species across Canada. Find out which you should plant to give monarchs a much-needed boost. Be patient with caterpillars that are eating their way to butterfly-hood. Influence agricultural practices both in Canada and abroad by buying organic products where possible. Support your local beekeepers. Though honeybees are not native to Canada, they are critical to our current food system. Native bees can be great pollinators, but most large-scale agricultural practices currently rely on honeybees. With increasingly frequent reports of colony collapse disorder among honeybees (where almost entire colonies of bees mysteriously die off) the livelihoods of the people who care for these important pollinating bees are threatened. Buy shade-grown coffee to help slow the deforestation of Central and South American countries. Write your MP and MLA/MPP to show your concern for our pollinators. 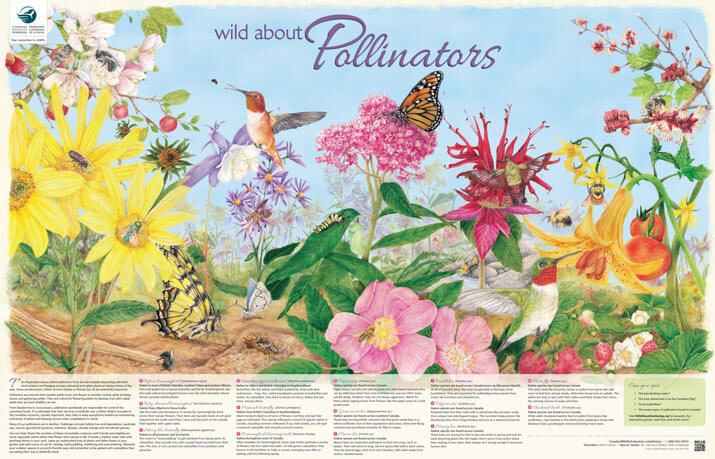 Have fun finding pollinators in this illustration and outside – along nature trails, at the cottage, on farms, in parks or even outside your front door!